There are, generally speaking, two types of racing games: super-serious simulations like Gran Turisimo and arcade-y fun runs with power-ups and speed boosters littering the track. Digital Realities’ SkyDrift is most definitely the latter. 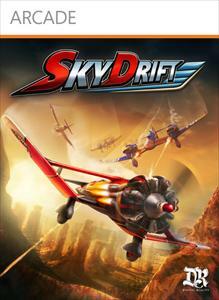 Instead of zipping around in cars, players break the surly bonds of earth and take control of a number of different airplanes. Taking to the air is natural with the simple but elegant control system that Digital Realities has implemented. Anyone familiar with any modern racer will immediately recognize the basic control scheme: right trigger for acceleration, left for braking, and the left analog stick for directional control. Your plane isn’t stuck in just one position like a land based vehicle, however. Pressing the left analog will make your plane go vertical and spinning it will make you do a barrel roll. This seemingly simple addition to the game’s controls adds a lot of variety to the experience. SkyDrift is almost pure arcade racing action. In a lot of ways, it reminds me of some of the older BurnOut titles. Lots of quick races, spectacular crashes that don’t hurt your chances too much, and bellicose opponents always looking to take you out. Sky Drift gets a lot of mileage out of its limited number of stages. Although you won’t mistake the landscapes for the latest Uncharted sequel, the levels are full of bright colors and attractive backgrounds. By reversing the direction planes race around the track, Digital Realities is able to create new content with a minimal amount of extra resources. The single player experience is good enough to warrant giving SkyDrift a try, but the real meat of the game is in the online multiplayer. The netcode is simply wonderful. With a decent connection, lag is almost non-existant. Blowing up other players is almost always more satisfying than making a computer opponent crash and burn and the game makes it easy to get right into a multiplayer fraucus. As a racing experience, SkyDrift is a complete success. Unique, simple, and exciting, it hits all the right marks for short bursts of gaming.